Surgeon Sanil B. Nigalye D.D.S., M.D., is trained in full scope oral & maxillofacial surgery and focuses his time and develops his expertise in wisdom tooth removal, dental implants and associated tissue regenerative procedures (grafting), and anesthesia. He is certified by the American Board of Oral & Maxillofacial Surgeons. Dr. Nigalye strives to improve patients’ lives by using today’s technology to deliver the best dental restorative solutions. Since 2007, Dr. Nigalye has devoted his time and career to caring for the people of the Greater Buffalo area by opening private practices in Williamsville and Niagara Falls. 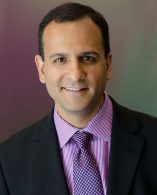 While his training is within the full scope of oral and maxillofacial surgery, Dr. Nigalye focuses on the management of impacted teeth, rehabilitating mouths through dental implants and tissue regeneration, outpatient anesthesia, and treatment of benign pathology of the head and neck region. After Dr. Nigalye received his medical and dental degrees from the University at Buffalo, he continued his studies in the 6-year oral and maxillofacial training program at UB. Through that program, Dr. Nigalye became versed in the management of critical care patients, vascular surgery, thoracic surgery to facial trauma, head and neck surgery, and more. Additionally, Dr. Nigalye is committed to lifelong learning and embraces continuing education because he believes it is important to be up to date with advances in dentistry and incorporate new surgical and anesthesia techniques for the benefit of his patients. Call today and schedule your consultation with Dr. Nigalye!